At some point last weekend, America decided its First Amendment was outdated – that Free Speech was no longer as important as protecting the vulnerable from the menace of Hate Speech. This decision came down from on high amidst a whirlwind of banning, deplatforming, and terminology-redefining, the product of years of collaboration between Big Tech and Big Government on how to break down the resistance to censorship that was so stubbornly encoded in this country’s DNA. Alex Jones was merely the test case – a toe dipped in the public stream of consciousness to gauge the effectiveness of the propaganda we’re being fed. Outside the conservative media sphere, the response to Jones’ un-personing – removed from YouTube, Facebook, Google, Apple, Spotify, Stitchr, MailChimp, LinkedIn, Vimeo, and finally Twitter in the course of a few days, a heavy blow the companies claim was not coordinated among themselves at all (wink, wink) – was tepid, with only a few brave commentators willing to bridge the partisan divide to defend Infowars’ right to free speech on principle. Some reprehensible shills even cried that the censorship hadn’t gone far enough. Big Tech took the Left’s cowardice as a green light and turned their censorship ray on the other end of the political spectrum. Telesur, the Caracas-based network home to Abby Martin, was booted from Facebook yesterday, an act the media greeted with a deafening silence far more terrifying than all the anti-speech “liberals” baying for Jones’ blood. Telesur and Martin were logical choices to launch Big Tech’s un-personing on the Left. Facebook’s partner in silencing dissent – now lumped in with “fake news” – is the Atlantic Council, whose board of directors reads like a who’s-who of western imperialism, with Henry Kissinger, Michael Chertoff, and Michael Hayden rubbing shoulders with CrowdStrike founder Dmitri Alperovitch, the man behind the Russiagate conspiracy theory. Martin figured prominently in the Russiagate intelligence community assessment, which devoted several pages to wringing its hands about her old RT show “Breaking the Set,” even though it had been off the air for years before the 2016 election; a woman-on-the-street piece she recorded last year that revealed the shocking bigotry of average Israeli citizens was banned in 28 countries on YouTube. Venezuela, of course, sits on the largest oil reserves in the western hemisphere and has long been on the war machine’s “to do” list (Venezuelanalysis.com was also dropped from Facebook, but later reinstated). Together, they represent everything that keeps the NATO-backed Atlantic Council awake at night. For all the hundreds of articles weighing in on the Passion of Alex Jones, hardly anyone mentioned Telesur’s disappearance – or the deletion of State Department whistleblower Peter van Buren, who was banned from Twitter for a relatively mild argument while all eyes were on Infowars; or the double vanishing act of Scott Horton and Daniel McAdams, two anti-war journalists whose Twitter accounts were yanked and then restored for defending van Buren. The narrative we are being fed is that Jones was out of line for his behavior – that questioning the facts of the Sandy Hook shooting is morally equivalent to yelling “fire” in a crowded theatre – so Big Tech made a Big Decision and silenced Infowars, in a precedent-setting move that won’t ever have sinister repercussions for anyone elsewhere on the political spectrum. Anyone capable of mustering a few scraps of historical context or even basic critical thinking understood that Jones was just the red-faced canary in the totalitarian coal mine, and that every alternative media content creator is now in peril. But the establishment media is telling us to move on – after all, Trump is attacking the press, and we have to stand with them! Pardon me while I puke on your solidarity. The not-so-secret weapon in the new-media censorship wars is Hate Speech – a nebulous term whose meaning is constantly shifting to suit the whims of whoever is using it. Since the 2016 election, Hate has been the domestic bogeyman of choice, the enemy within while Russia plays the role of enemy without. The Southern Poverty Law Center, the Anti-Defamation League and other fearmongering groups tell us Hate is on the rise, that Hate Crimes have skyrocketed since Trump’s election, that Haters are being radicalized online at a breakneck pace – and that only drastic, even unconstitutional measures will stop the insanity. The establishment media have rushed to cover anything that looks remotely like a white supremacist gathering, often outnumbering the actual participants with their camerapeople and reporters. Only by exposing the Haters, they say, will America free itself of the scourge of white supremacy – clearly the #1 problem in a country where the national debt is 940% of GDP and most of us live paycheck to paycheck, falling asleep to the lullaby that we live in the richest nation in the world. Hate speech is the ideal weapon for the deplatforming aggressive precisely because the term has no universally agreed-upon definition even as it provokes an emotional reaction. Nearly all of the platforms that banned Infowars cited “hate speech” as their rationale without claiming a specific example, though Facebook claimed Jones’ account was full of anti-Muslim and anti-trans bigotry. YouTube was the first to block Jones, making it impossible for those unfamiliar with his material to ascertain the truth of these claims. A political performance-artist who took a hard ideological swerve right with Trump’s candidacy, Jones has replaced much of the anti-police-state rhetoric that endeared him to his early audience with more typical conservative talking points, including a reprehensible knee-jerk Zionism that sets him in clear opposition to Islam. Still, a rational mind would be hard-pressed to classify his words as “hate” unless one radically redefined “hate.” Which is precisely the idea. Liberals, unaware of Infowars content, take Big Tech’s word that it is hateful and repugnant – he questioned Sandy Hook! – but don’t bother evaluating it for themselves because of their visceral aversion to anything deemed “hate speech,” and his relatively anodyne comments retroactively come to embody hate speech, since no one is sure what the term means anyway. Definition creep sets in, and overnight half the conservative media finds itself on the wrong end of Big Tech’s terms of service. Twitter clone Gab, the favored platform of the alt-right ever since it welcomed victims of the 2016 “Twitter purges,” was threatened by Microsoft with the cancellation of its web domain last week because of two anti-Semitic posts made a month ago by Republican Senate candidate Patrick Little. Why Microsoft would take down the entire platform because of two objectionable tweets was never properly explained – certainly, the platform is home to plenty of other objectionable messages by less-well-known users. The threat may have been an effort to force Gab to betray the principles that originally attracted users like Little who’ve been expelled from other platforms – “free speech, individual liberty and the free flow of information online” – principles sure to attract more users as Twitter begins purging anew. Little removed the offending tweets, and Gab survived to offend another day. Meanwhile, PayPal has been quietly dropping users linked to the Southern Poverty Law Center’s infamously inaccurate “hatewatch” list since last year. Banning the “haters” is only the first step in Big Tech’s Big Crackdown. Google’s shadowy Jigsaw arm recently developed a tool called Perspective which aims to root out “hate speech” before it spreads. Built in collaboration with the New York Times and Wikipedia, Perspective uses “machine learning” to “spot abuse and harassment online,” analyzing the flow of online conversations in the hope of predicting (and preemptively redirecting) their trajectory. The tool could presumably be deployed against content creation on Big Tech platforms in real time, though the PR materials limit their discussion to its potential in moderating comments sections. A similar initiative is in development at the ADL, which is working with UC-Berkeley to develop an “online hate index” to “better understand the growing amount of hate on social media,” uncovering and identifying trends in “hate speech” across different platforms. The goal is a “community-based” definition of hate speech – but they never say whose community gets to do the defining. Given the ADL’s rabid demonization of anything with a whiff of criticizing Israel as “anti-Semitism,” such a tool in their hands should worry political analysts and anyone who comments on world events. Jigsaw is already looking beyond “hate speech” to influence real-world behavior. Its Redirect Method began as a beefed-up AdWords aimed at convincing potential ISIS recruits to think twice about joining the US/Israeli-backed terror group; the program is now being positioned as the perfect tool for countering the uniquely American specter of White Hate. Instead of merely pointing the hapless would-be terrorist to YouTube videos debunking ISIS propaganda, Redirect’s successor Moonshot follows up the ideological rebuttals with messages from “undercover social workers” embedded in extremist forums. The infiltrators “discreetly message potential recruits to dissuade them,” an act that takes on sinister implications considering the vast wealth of personally identifying information Google hoards on its users. Given that the program has no way of distinguishing between an individual looking to be radicalized and someone doing research for a film or journalistic piece, the privacy ramifications are – as with everything Google – disturbing. It is one thing to be concern-trolled by an online do-gooder; another entirely when the concern-troll is armed with your home address, your phone number, and your bank account information. A Wired article on the program also suggests that Google readily supplies the incriminating search data to authorities, dispelling any illusion of the tech giant’s concern for the well-being of wannabe extremists. 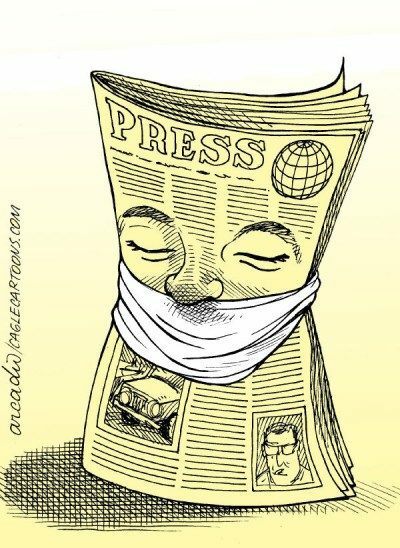 Led by the Boston Globe, 300 newspapers have colluded in Sinclair-media-esque fashion to publish editorials in defense of a “free press,” as if Trump’s disparaging remarks about “fake news” represent the most significant threat to their ossified business model. The Globe published a poll indicating 48% of Republicans believe “the news media is the enemy of the American people” – but this is a situation for which the establishment media has only itself to blame. Decades of biased pro-corporate warmongering have taken their toll, and the average American has had their fill of lies. The best journalism has long since migrated online and away from the big legacy names, and social media platforms have assumed the role once held by the television. Meanwhile, Facebook’s Mark Zuckerberg has threatened the entire old-media establishment with economic death if they do not work with his platform to “revitalize journalism.” It is difficult to tell whether establishment media or Big Tech poses a greater threat to press freedom – both are chillingly effective tools of control wielded by the ruling class against the people, and Zuckerberg’s idea of a “revitalized” journalism is the stuff of nightmares – but as the online platforms increasingly come to resemble establishment media with their unhealthy appetites for gatekeeping and censorship, it is clear that neither see themselves as friends to independent journalists. Some have naively called for the government to step in and regulate Big Tech, reasoning that their platforms operate as monopolies and should be treated as such under the law. While it’s tempting to call in Big Brother to clip the wings of Twitter & co., such an act would trigger a slide down yet another slippery slope. Corporations are already the willing partner of the US government in enacting almost-laws that violate our pesky constitution – Facebook, Twitter, YouTube and the other tech platforms have been discussing the banning of Infowars in meetings with congresspeople for months. The Deep State knows it can’t openly strip citizens of their First Amendment rights just yet, so Big Tech is deployed to do their dirty work. Once the government legally has its hands on social media, there is nothing stopping them from exerting even more control over these platforms, bringing full circle the process that began when the Pentagon’s Orwellian “LifeLog” project was scrapped and reanimated in the corporate sector as “the Facebook.” Fascism is characterized by an alliance at the highest level between corporations and the government, and further defined by heavy-handed censorship. This – not a mere figurehead like Trump – is the greatest threat to press freedom today.